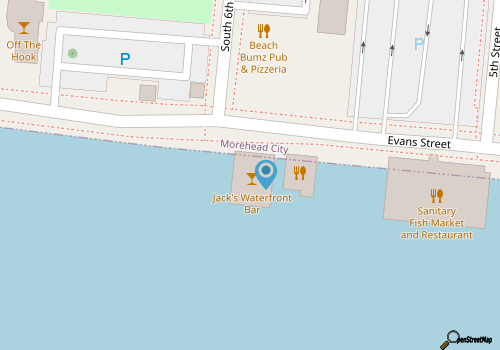 Take a break from strolling through the cool waterfront streets of Downtown Morehead City, and settle in for an ice cold drink and a remarkable view with a visit to Jack’s Waterfront Bar. Located in the heart of the downtown region, and easy to find for visitors who are hanging out along Evans Street, this family owned and operated bar is only waterfront bar in town, and features a wealth of seasonal live music, entertainment, and plenty of great views to go around. While the outside might not look like much to visitors passing by, the interior is warm and welcoming, with plenty of room for multiple bar patrons, and works by local artists on full display throughout the interior. The big draw at Jack’s, however, is those sunset views, which can be admired by simply stepping outside to the waterfront deck. While the views are more than enough to keep bar patrons entertained and happy, Jack’s Waterfront Bar also features a regular calendar of live entertainment, which includes renowned local artists, bands, and DJs. With lots of regular drink specials, and cool music to keep visitors dancing throughout the night, Jack’s is a great destination for both Happy Hour fans and Crystal Coast night owls alike. Call (252) 247-2043 for current hours.